I'm really happy with this purchase, and it has made my day hikes far more pleasant. When I bought this pack, I was over 300 pounds with a 54" waist. This pack juuust fit comfortably. Now that my weight has come down quite a lot (thanks to all that hiking), it fits even better. This pack is really adjustable and it took just a minute or two to get it really dialed in nicely. It just feels like part of my body when I'm hiking now. And I really love the ventilation. I don't arrive with a sweat-soaked back! I don't know how much crap some of the other reviewers like to carry on a day hike, but for me this thing is great for going on a 6-10 mile hike that doesn't involve carrying a bunch of camping gear. Some clothes, some food, and hydration... I don't need to put much in there, and it all fits with room to spare. Most of the space is taken up by one big main pocket. It's worth putting a little thought into weight distribution if you're trying to push the limits of this bag. For me, since my day hikes don't involve a lot of gear, I've not had problems with weight distribution. Since this is mostly just one big main pocket, though, accessibility could be a challenge for some. There are a couple of smaller pockets to keep small things easily accessible. Those have been really great for stowing a small camera, some snacks, and a first aid kit. The rain fly is stowed in its own dedicated pocket underneath of the bag. It feels like an extension of my body. Once it's dialed in, it doesn't wobble around at all. I love it! I'm going to pick a nit with an otherwise great bag: getting the hydration bladder in and out is a bigger pain than it needs to be. It's not awful, but this is the one really "not wonderful" part of the experience with this bag. Solid. I've been using this pretty regularly for a couple of months now and it's still like new. I suspect I'll have this bag for years. I've had this bag for a little over two months now. I use it primarily to hike in the woods of central North Carolina, and in all weather conditions. My typical hikes are 4-10 miles at a pretty brisk pace. I've been rapidly losing weight while hiking with this bag and it's adjusting with my shrinking body mass really well. A great ride daypack with limited storage, but wonderful airflow and good hydration options. I've had this pack for about 5 years and it went from being my daily commute pack to a standby and now is back to a daily pack. I've mostly used it as a biking backpack and don't know how it would handle regular use as a daypack for hiking, but I love the way it fits and sits so much that I'd be happy to have it along, if it fit a day's worth of gear. It might not be obvious by looking at it online, but the pack has a HUGE airflow chamber that takes up almost half of the space of the large pocket. The airflow chamber is a mesh and plastic rod-framed enclosure that is against your back, allowing for very good airflow. While riding I can dip my head and expose a bit of the top of the pack to wind and feel it against my back. Great for commuting in your work clothing or for hot days when you don't want your pack sweating up your back. The downside is that you have a rather large looking pack that can hold about one jacket, a long sleeved shirt and a snack. Not that I haven't loaded it down though. With two elastic pockets on the sides, strapping on the back and a large elastic pocket on the back of the pack, it can be stretched and crammed to hold a lot. I've come home with my pack full of food and a case of beer (cans) strapped snugly on top of the load, using the cargo straps to hold it on. The elastic pocket is perfect for my extra large bike lock and a couple frisbees, but not large enough for a bike helmet or soccer ball. In fact, I have to deflate my volleyball to get it through the zipper in the main compartment because of the airflow enclosure. There is a fair amount of adjustment to the harness, with double adjustment on the shoulder straps and user-friendly straight pull tightening on the hip belt. The torso length is fixed, but with the shoulder straps being adjustable, it can work well for a range of sizes. It has an inside pocket for a hydration pack, but, and this is a fun feature, there is also a zipper that lets you put the hydration pack inside the airvent enclosure, which saves a ton of space. With a 2L water pouch in the main compartment, the pack is almost full, so putting it in the air space is almost a must. This has the major drawback of warming your water with almost direct contact from your back. Great if you fill the pouch with ice and let your back sweat melt it into water, but really crappy if you don't want back-temp water after 2 hours. There is plenty of length and width to put an insulating sleeve around the water bag though, so this could be remedied. The durability is solid, with all straps and seems holding up so far. The weak points are where the bag rests on the ground (cordura) and the elastic pockets which have become stretched out like a wizard's sleeve. I've had my coffee thermos fly out in traffic because I leaned a bit and the elastic wasn't snug enough. Ok, it's happened a few times so I should probably learn to not put it there, but putting it inside risks coffee stains on my work clothes. I'm against reviews of gear you've had in your hands for only a few minutes. Something may look tough or feel nice when you put it on the first time, but if you pay $120 for a pack, it should hold up for a long time. This one does and it feels really nice on my back and secure while I'm riding or walking. Not useful for walking around campus with a load of books, but very nice for a hike or extended bike ride. Although the pack has a number of features not found on other packs in this price range, it has been a disappointment. There is a flimsy wire stay in the back under the mesh designed to hold the frame rails apart. When using an Osprey branded water bladder in the pack, this stay would consistently pop out. This stay is one of the only attachment points keeping the midsection of the bag to the frame. We returned the pack to Osprey, were shipped a new pack, and the same thing happened within a week. I can dislodge this important piece of the frame with no more than a tap of my finger. Extremely comfortable daypack with one main large comportment, two smaller zippered stash pockets, two side mesh pockets, and two hipbelt pockets. Other features include an integrated raincover, sleeping pad/bag straps, a trekking pole attachment point, and an ice axe loop. Overall, it's an excellent daypack with one slightly annoying feature: an awkwardly designed and/or placed hydration sleeve. I absolutely love this pack. It's a perfectly-sized daypack that has just about every feature you would want in a mid-sized daypack except for an outside stash pocket (or shockcord webbing) to allow for stashing a wet rain jacket (although maybe the integrated rain cover is the reason for this). I've never felt a more comfortable suspension than the well-ventilated, mesh-paneled suspension of the Stratos 24, and I cannot complain about the hip belt either, comfortable with dual matching, wallet-sized pockets perfect for a wallet, a cell phone, or other smaller items. The pack also has an integrated rain cover (although I haven't had to use it yet), two size mesh pockets for water bottles (taller thinner bottles work better than standard Nalgene bottles if the main compartment is full), sleeping pad/bag straps, a trekking pole attachment point (something Osprey calls the "stow-on-the-go" trekking pole attachment), and a loop for an ice axe. With all of that said, I am not giving it 5 stars for one small, albeit annoying, reason: the hydration sleeve. 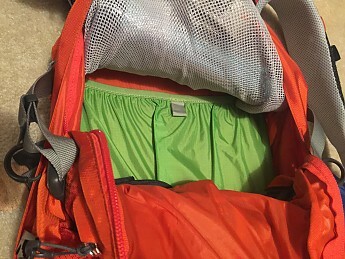 The zippered stash pocket adjacent to the hydration sleeve is located in such a way that I cannot install or remove my [Osprey] 3L hydration bladder without emptying the pocket. In the picture below, you can see that a full stash pocket limits the accessibility of the hydration sleeve. At the end of the day, it's probably a small, first world problem to some, but I've found it annoying because I keep a number of small things in the stash pocket, although not annoying enough to dissuade me from recommending it. Thanks for sharing this helpful review of your Osprey, pearljam42. Do you have any pictures of your pack you'd be willing to share in your review for others to see, especially of the hydration sleeve position? Sure thing, Alicia - just added a photo and updated the review. I like this pack very well. I take it with me everywhere. I like this pack very well. I take it with me everywhere. I would recommend it to anyone who is looking for a durable and functional pack. I got this pack to replace my old Walmart day pack. I got it in March and have hiked with it several times. the thing that I like most is that I can load it to its limit and it doesn't feel awkward, it just feels like part of me. When I have to get another pack it will most likely be an Osprey, it just fits SO well. I use it most for long day trips and it holds all I need and then some. 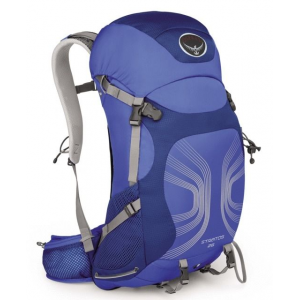 The Osprey Stratos 24 has an excellent innovative and well ventilated back panel and hiking pole/ice axe stash system. 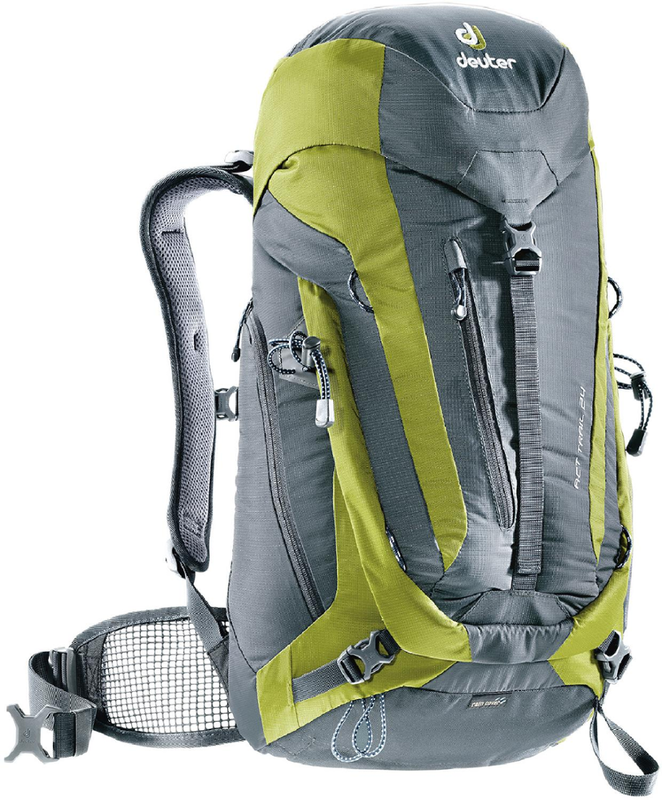 The innovative back panel makes the pack one of the most ventilated packs out of my bag. The hiking pole/ice axe stash has convenient features for hikers to carry their gear. Excellent day pack. Very comfortable on warm days. Excellent day pack. Very comfortable on warm days. Carries just enough stuff whether you are going on the trail or taking the kids to the park. I originally got this pack to take with me to Kenya on a 10-day journey. I was looking for something that I could take easily on an airplane, use for day hikes, and be an overall kid stuff carrier on trip with the kids. I opted for the grey version. I did not want something that stood out in the crowd especially when traveling overseas. The grey looks nice but blends in. The materials on the pack look great. After a full year and many adventures it looks almost as good as new. I could see this pack lasting easily 5-10 years without any signs of serious wear and tear. It is big enough for me to pack two days worth of clothes, a rain jacket, small medical kit, SLR, and a large ziplock of food. Not to mention the small things like passport, wallet, sunglasses, headlamp etc... I was also able to put a small umbrella in one water bottle holder, and a water bottle in the other. The water pockets are tight squeeze for most water bottles. I could squeeze in a Camelbak Podium Pro in there but anything larger like most other Camelbak or Nalgene bottles would be a tight fit if the pack was full. This pack is not very large, I am not sure what you would put in there to make it weigh more than 25-30 pounds. I did have it around 25lbs one day and it was very comfortable. Using it to carry mostly clothes and it is as light as it gets. You will barely notice it on your back. The straps for the pack or easy to locate which makes getting a good fit on your back easy. What I really liked is when you move fast the pack stays right with you. My favorite feature is the "hammock" back which allows plenty of airflow on your back. Even in the hot Kenyan sun I stayed relatively cool. No dry front, sweaty back looks for me. I have taken this pack on several day trips in the Porcupine mountains and it worked out great. Plenty of space for 4 light jackets, first aid, and trail bait for the kids. This is a versatile lightweight pack. My only regret is that I did not go a size or two larger. The only reason I didn't was because I did not want to get hassled in the airport. A lot of people seem to hate on this pack because of some of its design features. I love it. I think it's one of those things where you either hate it or you love it. It has very nice features and I especially enjoy the ventillated back panel. The stow n go trekking pole storage is great too. The shape is a bit awkward, but once you get used to it and as long as you use this pack as intended, a day pack, it's a great one. Some also claim this pack isn't comfortable to them. I just don't see it. I was fitted for mine at a local sports store and proper adjustment and whatnot and I think it's one of the best day packs I've had. It compresses well and I have no problem using any of the features. This is a quality pack that will last for a long time. 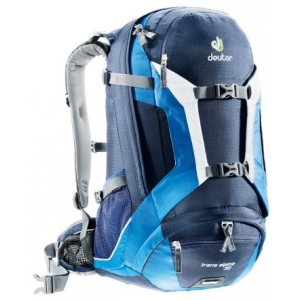 This is a great durable pack for those day long hikes as you would expect since it is a day pack. 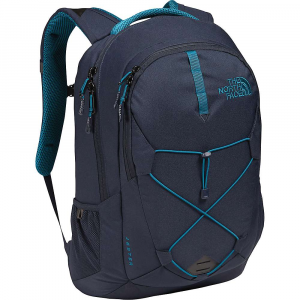 Its air flow back is very comfortable in the summer but it does push the pack a few inches off your back which can cause some back pain by the end of a hike if you're carrying a heavier load. It isn't too big of a problem since I usually don't carry too much with me, but it is something to think about if you carry things for a child or something like that. If you're looking for something to just throw some food, water, and a jacket in for a 5-6 hour hike though, then this pack is great. Wow...this is an awful bag for hiking, if you want it for school maybe decent. The curve is way too big! The vent is super nice, but causes a pulling feeling on your back. Nothing sits on your bag or shoulders and kinda feels like it is dragging. Not enough storage really for anything but a super light day hike (bladder, layer, first aid and or snack). I love the color a lot! Not something I would recommend though for anyone looking for something serious. I commute 10 mile to work on my Trek 7300 and I need a change of clothes once I get to work, especially in the summer. (I take advantage of the showers at my facility.) Previously I would keep clothes at work, but this limited my wardrobe since I didn't want to keep all my clothes there. I needed a quality backpack, so I went to a quality outdoor outfitter. They recommended the Osprey Status 24; I fell in love!! Extremely light-weight made with double ripstop nylon; durable (Osprey offers a guarantee where they will repair for any reason, free of charge, any damage or defect - as the put it "whether it was purchased in 1974 or yesterday." The pack is roomy with too many compartments to count, plus you can expand or contract the pack as deemed fit. The Osprey Airspeed Suspension system really works noticeably well in keeping you back nice and cool. I could see me using this pack on a nice hike. I'm 5' 10" 185 lbs and I would recomment the L size for someone of similar stature (they come S, M, L). The Osprey on-line site has a formula to measure yourself, but just to be sure, I would go to a reputable dealer and have them properly fit you. This pack goes everywhere with me. From work to taking the dog for a hike, I have used and abused this pack. My only complaint is when the pack is overloaded with weight (around 25+ pounds) the back panel supports will dig into my lower hips causing discomfort after a long hike. As the other reviews have stated, the back venting is just amazing. The padding is perfect and once you get used to the layout there is a plenty of space for any activity. 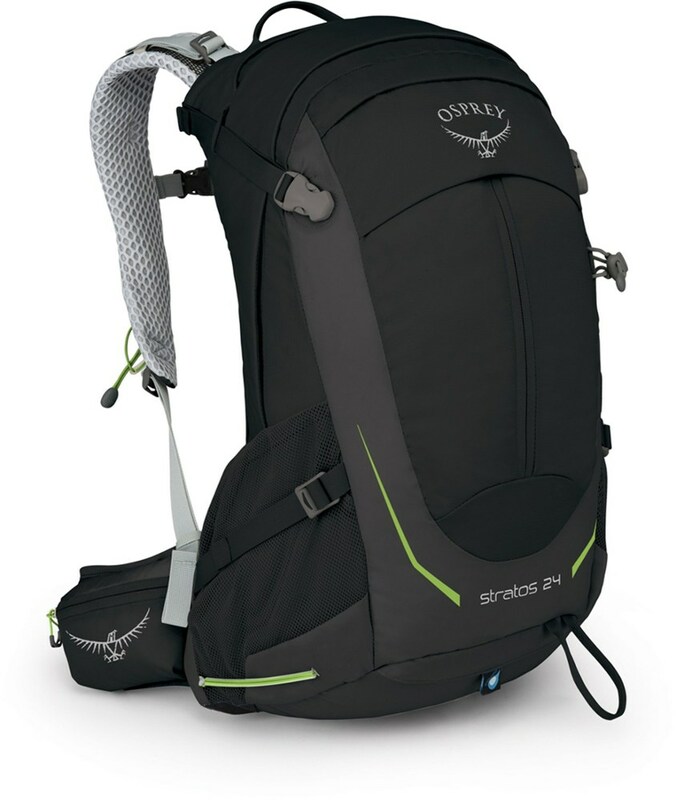 I recently bought an Osprey Stratos 24 backpack for day hikes. When I was looking at it in the store I was very skeptical. I have been hiking with an old army backpack from an army navy, shop, you know one of the canvas indestructible packs... so being used to that I didn't think the Osprey would hold up. I didn't think it could hold a first aid kit, water, coat, snacks or much else. I was wrong! I loaded it with the first aid kit, a good weight jacket, three bottles of water (I haven't bought a 2 L bladder, yet) a shirt, phone, camera, and some snacks. This hadn't filled it to the half way point. Realizing this I think if the weather were nice, and you pack intelligently you could definitely load this pack up and stay the night in the woods. Those who find it necessary to bring a mini-mall with them camping, would not agree. So my girlfriend and I went on a dayhike with our new backpacks. I was impressed the aircore in back was amazing. After hours of hiking, my back was still cool. Anyone who has used a canvas bag knows how hot your back gets after hours of carrying the thing. Not with this bag. Every now and then a strong enough breeze would blow, and I would actually feel the air on my back! The straps are great. With the right adjustments it sits comfortably on your shoulders and hips. Sure we pack light, but we still have all the ponchos, blankets, lights, and random "I hope I dont need this, but if I do then it's here" stuff. And this pack held up great. As far as things that bugged me about the pack... at first I thought it was dinky inside, but I found out it stretches, and is purely deceptive. Otherwise nothing. I think it was a great investment for day hikes, and in the future hopefully for weekend camping as well. I recommend it to anyone interested in outdoor wandering. Height of Owner: 5' 8"
I have only recently purchased this pack, so I will have to write another review after it gets some more use. However, I also had the same experience with the medium being too small. I have an 18 inch torso and according to the sizing chart from Osprey, I was well within the range for the medium. When I got the pack, I was disappointed with the sizing. I could get the hipbelt snug on my waist, but, when I cinched up the shoulder straps, the bag shifted up and the hipbelt dug into my sides. So, this weekend I went to a local outdoor store and tried the large with about 15 lbs of weight. It felt awesome. The length was perfect. I've sent the medium back and am eagerly awaiting the arrival of the large. Just completed a tour of the South Dakota Badlands and Black Hills. This pack performed flawlessly. It is very comfortable for loads up to about 18 pounds (the maximum I carried on this trip). The Air Core back panel is great for ventilation, and the shoulder straps and hipbelt are very comfy. I did notice the suspension creaking once in a while, but it was minor and not an irritant. 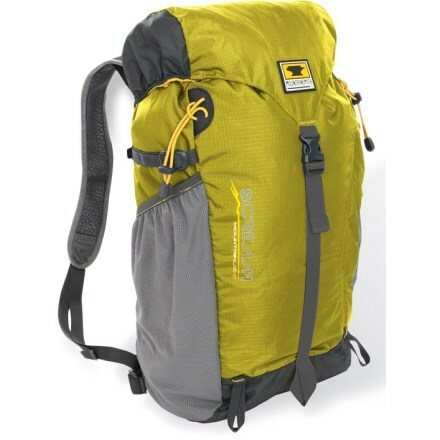 The pack itself is not ultra-light (2 lbs, 12 oz. in large), but that's not a concern for short hikes anyway. When the pack first arrived I was concerned that it was far too small (the curved back panel makes it look that way), but it stretches and swallows much more than you'd think. I like the dual-hydration option (one in the pack, one in the mesh backpanel), since I do a fair amount of hot-weather and desert hiking. Obviously using the interior hydration sleeve uses up pack space, but even then I still find plenty of room for a tarp, softshell jacket, first aid kit, and assorted sundries. In fact, I managed to fit enough for an overnight or even two-day trip in it. The small zippered pouch uses up main pack space but is very handy for small stuff. Speaking of small stuff, the hipbelt pockets are big enough for a small GPS, knife, and maybe a pocket digital camera, but not much more. The external compression system is excellent (I used it to carry a lightweight tripod) as are the little looped zipper pulls (great idea). The curved side pockets look shallow but hold a 16 to 20-ounce bottle securely. The front stretch pocket is quite handy as well, and deep enough that I don't worry about things falling out. I wish the shoulder straps were perforated like the Atmos series, but otherwise I can't find anything to nitpick. I can't comment on its durability yet, but based on Osprey's reputation and the excellent build quality of this pack, I expect it to last a long, long time. A note on sizing: I tried the medium but found that the shoulder straps pinched in too far and felt constricting (I have a 45 to 46-inch chest). The large is a bit "tall" feeling but overall is a much better fit. Big and barrel-chested guys might find this useful especially if you're ordering on-line. I work at an outdoor outfitter store and have seen many technical daypacks, but I must say that the technology and thought that Osprey puts into their products is truly impresssive. I am really impressed with the amazing flexibility and venting ability of the Aircore suspension. The Ergo-Pull hipbelt demonstrates how every detail matters in each pack Osprey produces and carries 25 pounds very comfortably in conjunction with the StraightJacket compression system. The stretch woven pockets on the outside of the pack beat the hell out of mesh, too. The Stratos 24 doesn't carry books particularly well, but when packed correctly it's not a problem (I can manage to fit my 17" Apple MacBook in there with no problem if I need to). 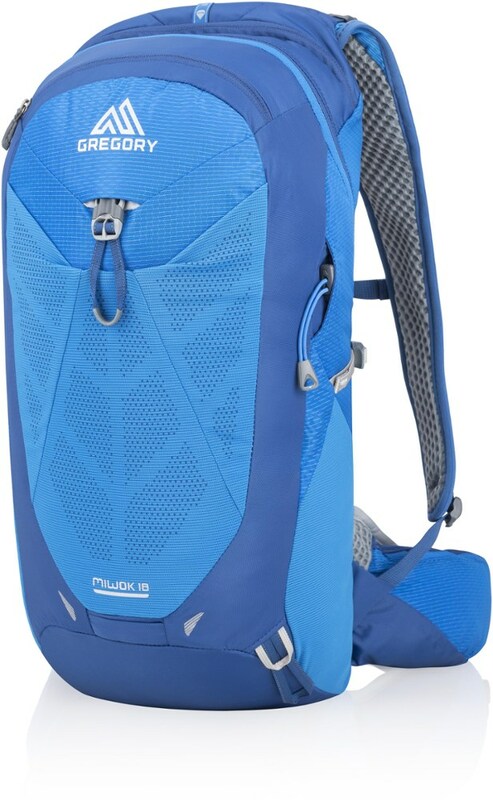 I compared this to the Gregory Halo technical daypack but this was much more flexible, vented much more easily, and carried loads much better. The large mesh back is amazing at venting. The whole pack flexes with my back perfectly. Great daypack. I found the inside design to be poor when carrying books because of the aircore design.